Ireland are five wickets away from regaining the ICC Intercontinental Cup in Dubai, having set defending champions Afghanistan a stiff target and then reducing them to 136 for 5 in the chase. Left-arm spinner George Dockrell struck three blows to leave Afghanistan struggling, still 211 short of the target at the end of the third day. Ireland were 159 for 2 in their second innings at the start of play, with Ed Joyce on 74 and Niall O'Brien on 40, but their 110-run stand ended in the first over, when Joyce was bowled for 78. O'Brien and Andrew White almost took Ireland to 250 with their partnership of 81, but once White fell for 39, Ireland lost three more wickets for 24 runs, including O'Brien for 87. Kevin O'Brien and Trent Johnston chipped in with useful scores before Mohammad Nabi took the last three wickets to finish with 4 for 38. Ireland had posted 341, leaving Afghanistan to chase 346 for victory. Afghanistan lost their opener Shabir Noori to Johnston in the first over of the chase before Nawroz Mangal and Mohammad Shahzad steadied the innings. Their stand, however, added only 57 runs - John Mooney broke it - after which Dockrell took three wickets in the space of 10 runs to reduce Afghanistan to 85 for 5. 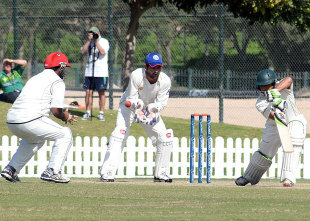 Nabi and Rahmat Shah put on an unbeaten stand of 51, but the task ahead of them on the fourth day was a tough one.